Subject title: What is hand-eye coordination exactly? What exactly is hand-eye coordination in terms of art? I have an example of what im talking about. 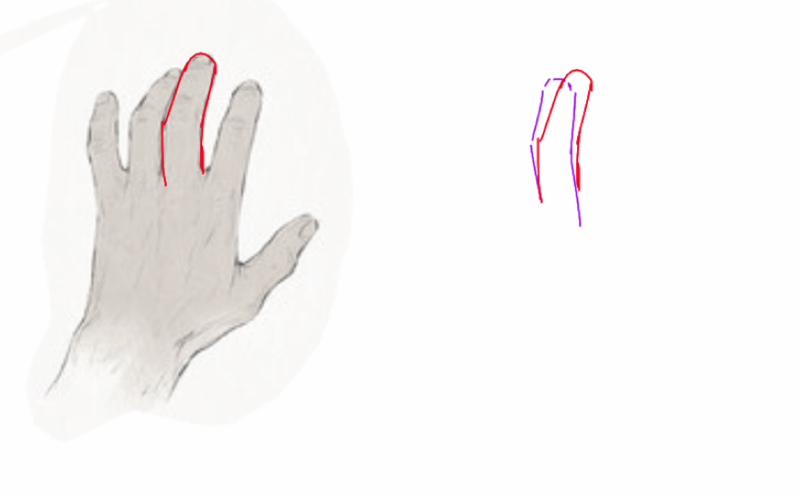 The darker purple line is my attempt at trying to copy the finger shape and im mostly looking at the reference and not at what im drawing but it still didnt turn out looking right...like my eyes can see the image but my hand doesnt follow it exactly. Advice would be greatly helpful! Hand-eye coordinated is how synced up your hand and your eye are. In art, putting the line where you want it is partially dependent on this. You're probably not going to get this perfect without a lot of guides and repetition though, so don't sweat the small things. It's like playing an FPS video game, you can train your hand-eye coordination to always hit the target, but pin point accuracy is not always guaranteed. Hand-eye is more the physical aspect of drawing. It is being able to control your hand to do what you tell it to do. Being able to draw exactly what you see has more to do with how well you can interpret what you see, then using your hand-eye coordination to put what you interpret on the canvas. Knowing how to measure and compare will help with how you interpret things. Ambiguity wrote: Hand-eye coordinated is how synced up your hand and your eye are. In art, putting the line where you want it is partially dependent on this. You're probably not going to get this perfect without a lot of guides and repetition though, so don't sweat the small things. It's like playing an FPS video game, you can train your hand-eye coordination to always hit the target, but pin point accuracy is not always guaranteed. I think i understand what you are trying to say! The game analogy help a lot actually are there any things i can do to help get better at being more accurate? Audiazif wrote: Hand-eye is more the physical aspect of drawing. It is being able to control your hand to do what you tell it to do. Being able to draw exactly what you see has more to do with how well you can interpret what you see, then using your hand-eye coordination to put what you interpret on the canvas. Knowing how to measure and compare will help with how you interpret things. Im sorry about this but i still dont quite understand the bit about "control your hand to do what you tell it to do"
For example would it be something like making ur hand draw at a certain angle you see? if i practice measuring and comparing would my hand-eye corddination also get better as a result?